The Overwatch League’s Philadelphia Fusion will own the first esports arena in North America. The $50 million Fusion Arena will seat 3,500 people and be built in South Philadelphia this summer. It’s all expected to be finished and usable by 2021. It’s the first ever stadium that’s dedicated to esports in North America, and it’s modeled after those already found in Asia. All of this money comes from Comcast, who owns the Philadelphia Fusion. The company will fund the building of the 60,000 square foot building that will include a training facility, broadcast studio, and the Fusion’s team offices. When the arena isn’t being used for the Fusion, it’ll host other live events. The Fusion Arena obviously won’t make it into this second season of Overwatch League nor the next — which is when all of the teams will play in their home cities. 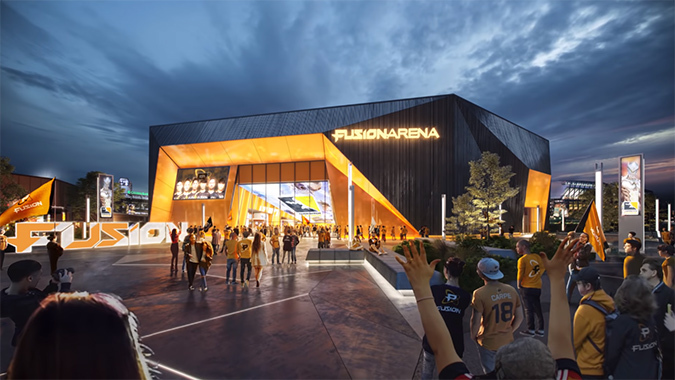 But by the fourth season, we can probably expect that construction will be finished and Fusion will be making a ton of use out of the arena. Right now, all of the Overwatch League games are played in the Blizzard Arena in Los Angeles. All of that will change next season. I wouldn’t be surprised if a few other esports arenas pop up, especially since big companies like Tencent own the teams in the league who are in need of a home stadium. We’re not even halfway through season two of Overwatch League, and it seems like season three is going to be way bigger and way more costly. The only worry is that all of that traveling could have a big effect on the players. They already deal with enough stress as it is. I’d expect a significant schedule change from this season and I hope it works around play schedules and off-time. The scope is huge next season and it’s only going to get bigger as more teams are added.